It’s an odd time of year. It’s almost spring, but few things besides chard, kale, and cabbage are growing in most Santa Cruz gardens. The local Farmers’ Markets don’t start for another month or two. It’s nearly a new spring but with the same old winter veggies. So we’ll be stuck with root veggies, winter squash, chard, and cold-friendly crucifers for a while. On the bright side, it's the perfect time to try something new and different with the more-of-same old veggies—something more creative than just steaming or baking. Let’s (re)introduce the Brussels sprout, with in-season maple syrup. Yoga Journal, where I found this recipe, is all about health and not about cooking. So I’d expected the recipe to be healthful and easy. 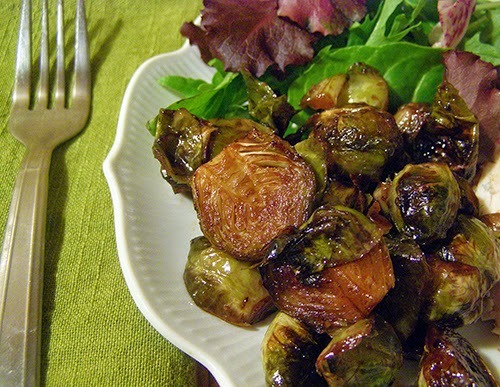 I was pleasantly surprised that it’s a delicious and different take on Brussels sprouts. 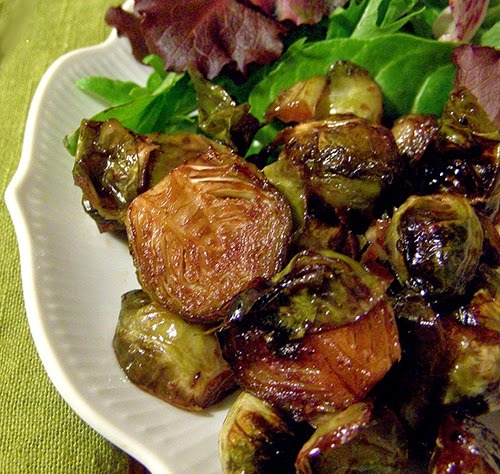 Balsamic and maple roasting caramelizes the sprouts, mellowing out their strong flavor and softening their texture. Because this recipe is quite sweet, I served it with a squeeze of fresh lemon juice and a light sprinkle of salt. I also reduced the oil from ¼ cup to 2 tablespoons. If you reduce the oil, remember to watch the sprouts during the last phase of baking and stir as needed to prevent over-caramelization (AKA burning! Preheat oven to 400 degrees F. Trim ends of Brussels sprouts and remove bruised outer leaves. Cut in half lengthwise. Place on baking sheet. Beat together balsamic, olive oil, maple syrup, and salt till emulsified. Pour balsamic mixture over sprouts on baking sheet. Mix together with hands till all sprouts are coated. Spread out sprouts into a single layer. Grind fresh pepper evenly over sprouts. Roast in preheated oven for about 15 minutes. 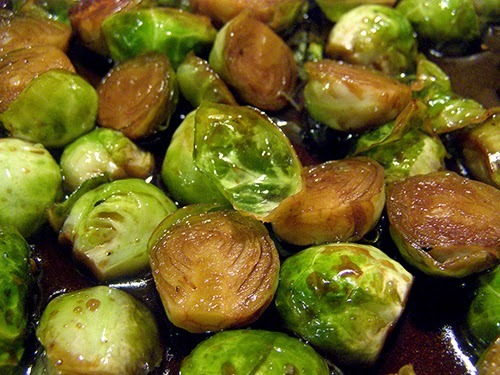 Remove from oven and stir, flipping the sprouts so less-browned sides face up. Return to oven and roast another 15 – 20 minutes. You might want to stir them once again during this final baking time, especially if you used the reduced amount of olive oil. 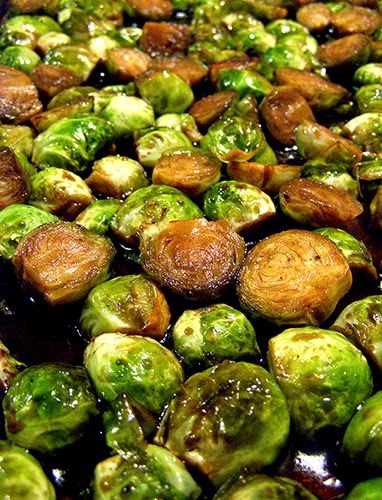 When sprouts are softened and caramelized, remove from baking sheet into serving bowl. Serve with fresh lemon wedges.